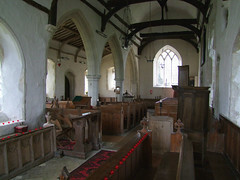 This was one of the first churches I ever visited in Suffolk. 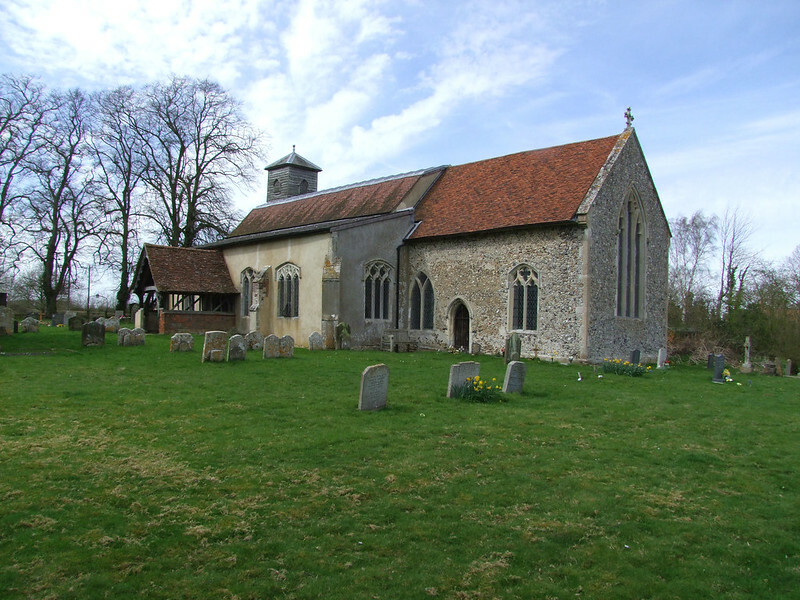 I'd been told about it by the great Suffolk Churches writer Roy Tricker, and although it wasn't a church which featured very strongly in books about the county, I wanted to see it for myself. Over the years I've popped in when I was passing, most recently in the spring of 2015. I suppose that not much has changed in the village since my first visit back in the early 1990s, and when I look at what I wrote there is not much to correct. It is still a delightful village in the gentle hills between Hadleigh and Lavenham. 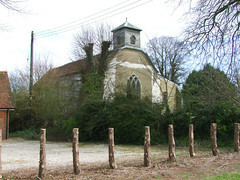 The chapel of St James, now in the care of English Heritage, still hides away behind a hedge on the top road. Tragically though, one of the pubs has closed. The White Rose is no longer, and only the Red Rose remains. These two had existed at either end of the village for centuries, and for one of them to be lost is like an arm being lopped off. I remembered my previous visit, almost ten years ago, with my children on an icy January morning. The temperature was just creeping above freezing, the rime of frost retreating and dissolving, the air stunningly clear in the bright winter sunlight. Across the valley I could make out scatters of crows miles away, and there was a frozen silence that I loved. 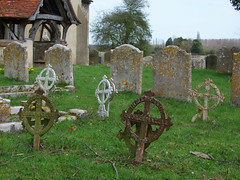 I stood and breathed the cold air, and then the cries of my childen larking in the graveyard brought me back to reality. 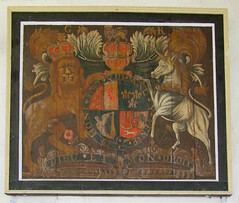 Lindsey, and its neighbours Kersey, Boxford and Groton, was a hotbed of puritan dissent in the early part of the 17th century, and from here hundreds of families fled across the Atlantic to the new world. 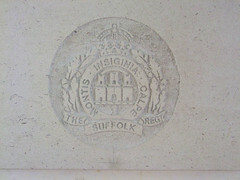 The Winthrops, of tiny Groton, would become founders of the State of Massachusetts. But most of the settlers were poor working families, and they would devote themselves to quiet, prayerful unpersecuted lives, and work hard to build new communities. Of course, they would never see Suffolk or the valley of the gentle Brett again. Did they miss it? If I had been brought up in this beautiful landscape, I would always remember it on a bright winter day, and yearn for it. I don't suppose that I would ever stop longing for it if I knew I could never see it again, and all across New England you find towns and villages with the names of East Anglian villages, including Lindsey, Kersey, Boxford and Groton. 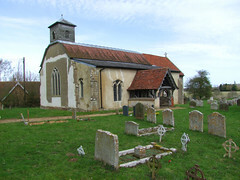 In comparison with the touted glories of nearby Kersey, Monks Eleigh and Lavenham, this is a small, rustic church. 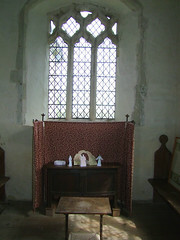 There is no tower, and little chancel to speak of. 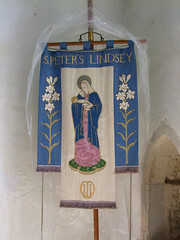 But of all the mid-Suffolk cloth-village churches, this is the one that most retains a sense of continuity. You can imagine the late-medieval liturgical presence here as easily as you can imagine its current use for Anglican congregational worship. There is a taste of every century. In winter, it is colder and damper inside than out. You step into an ancient space, furnished with lime-washed wood and cold stone. The white walls bow outwards, and large windows with their dropped sills intensify the sense of lightness and air. In summer, there is a sweet coolness about this building which intensifies its remoteness from the 21st century, and I long to go back on a hot day later this year. This is a church which retains a sense of mystical presence within its community, without the need for Victorian fripperies. It lends itself to private prayer far more than its grander neighbours. It is almost all of a piece, 14th century Decorated. The unsafe tower was removed in the early 19th century, and the clear glass of the west window fills the church with light. This is a building to delight in on a sunny day, with the subtle interplay of spangling on wood and stone. 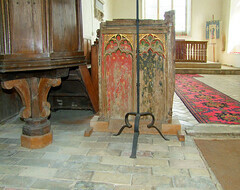 The light wood of the rood screen dado is set off by the surviving red, green and gold of the painted panels. 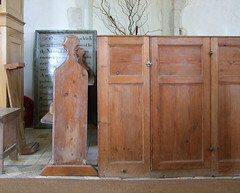 Beyond, the three-sided altar rails are almost ghost-like, the oak is so silvered. 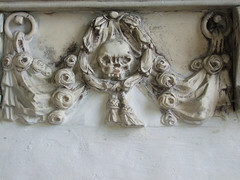 An early 17th Century memorial with grinning skull and garlands adds a note of absurd gravitas. 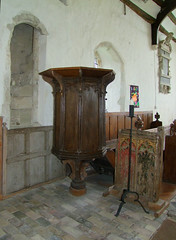 There are remains of paintings and image niches around the walls, and there is an ancient font, from about 1300. 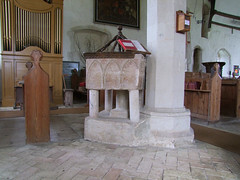 The font stands against a pillar on the arcade of the south aisle, which is traditional, but this font must have stood alone at some point, since it has designs on all sides. And, in any case, it is older than the pillar. There are some fascinating grafitti on this arcade, including a scratch-dial near the font, so this stone must once have been outside. There is what appears to be a 12th century bishop. 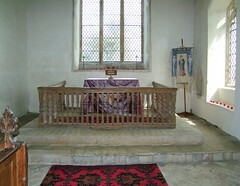 If this particular scratching is contemporary, then it is older than the church, and both these stones must have been reused from an earlier building. And there is a rose, to reminds us of the pubs. The great drop-window in the north aisle wall must have been off-set by an altar; Mortlock thinks to the guild of St Peter. 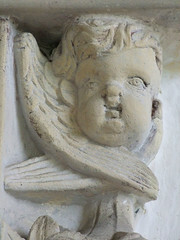 He also detects fixings for a parclose screen (and hence a chantry chapel) in the south aisle. 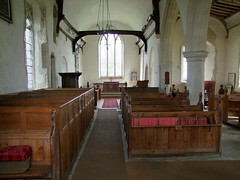 We have here an ordinary village church with much evidence of its former Catholic life. When I first wrote about St Peter, I said that this was a church that everyone should visit. It is quintessential rural Suffolk; timeless, without the Victorian triumphalism you so often find. I wanted to make sure that you didn't pass it by as you burn rubber between Kersey and Lavenham. I haven't changed my mind.